BACKGROUND: Phenobarbital is a known inducer of the cytochrome (CY) P450 enzyme system, with potent effects on the 3A4 enzyme. OBJECTIVE: To describe a case of an undetectable everolimus level in a patient with renal-cell carcinoma who was also receiving phenobarbital. CONCLUSION: When significant drug interactions with potent CYP3A4 inducers cannot be avoided, a dose increase of everolimus may be warranted, and sampling of trough levels may be considered. A 53-year-old white man with a history of hypertension, hyperlipidemia, tobacco use, and a remote seizure disorder was diagnosed with renal-cell carcinoma in February 2016. After diagnosis, he underwent a left radical nephrectomy with evidence of tumor-free margins. The patient’s tumor measured 4.8 cm, and pathology analysis showed staging consistent with pathologic growth into the renal vein with unassessed regional lymph nodes (pT3aNx). Three months later, the patient presented to our tertiary care center with shortness of breath and was found to have pleural metastases. Treatment was initiated with sunitinib 50 mg daily for 4 weeks of a 6-week treatment cycle. Two weeks later, the patient presented for a computed tomography scan of the chest, which revealed extensive interval worsening of metastatic disease. Shortly thereafter, he was admitted to the hospital for acute decompensated heart failure of unknown etiology, which was thought to be a potential side effect of sunitinib. After 6 weeks of sunitinib treatment, the treatment was switched from sunitinib to everolimus 10 mg daily. In October 2016, the patient was readmitted for decompensated heart failure. His medications (taken at home) at the time included everolimus 10 mg daily; metoprolol succinate 100 mg daily; furosemide 120 mg twice daily; senna 8.6 mg plus docusate sodium 50 mg 2 tablets twice daily; and phenobarbital 240 mg nightly, which he had been taking for more than 20 years for his remote seizures. In addition, he recently started treatment with gabapentin 300 mg 3 times daily, a lidocaine patch 5% applied to the skin once daily, and hydromorphone 4 mg to 6 mg every 3 hours, as needed, for new-onset neoplasm-related pain. A review of his laboratory test results at presentation indicated that the patient’s serum creatinine, alanine aminotransferase, aspartate aminotransferase, alkaline phosphatase, albumin, and bilirubin levels were within normal range. Evaluation of his preadmission medication list revealed a potential drug interaction between everolimus and phenobarbital. Subsequently, an everolimus serum trough level was sent to the laboratory. The results came back 3 days later, revealing a serum level of everolimus that was undetectable. To avoid further drug interaction, phenobarbital was discontinued, and levetiracetam 500 mg twice daily was started for seizure prevention. In addition, the patient was switched back from everolimus to sunitinib. In addition, in an open-label crossover study of 12 patients receiving rifampin and everolimus, rifampin decreased the everolimus peak concentration by an average of 52% and the area under the curve by an average of 63%. The study investigators found significant variability between patients.6 A similar phenomenon may be expected with concomitant use of phenobarbital and everolimus. 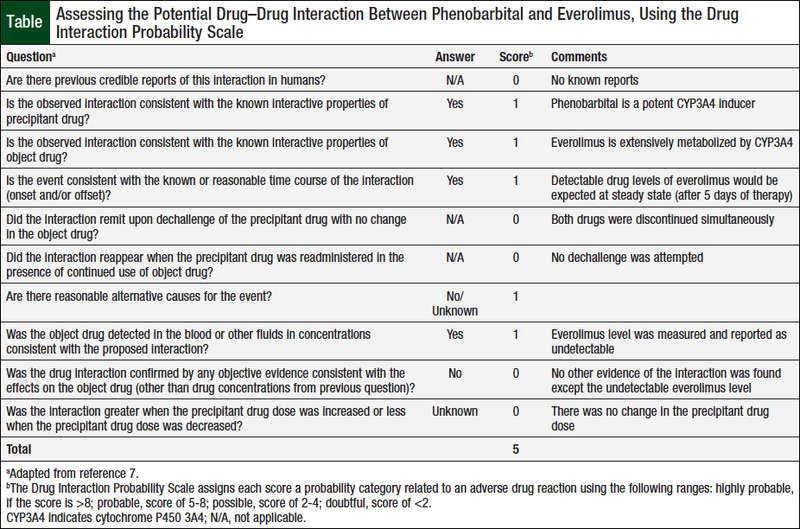 The potential drug–drug interaction between phenobarbital and everolimus in our patient was assessed based on the Drug Interaction Probability Scale.7 Applying evidence from our case, the interaction between the 2 drugs resulted in a score of 5, signifying a “probable” drug interaction (Table). One factor that likely reduced the score from “highly probable” (ie, a score >8) to “probable” (ie, a score of 5-8) is the simultaneous discontinuation of phenobarbital and everolimus; we were unable to evaluate everolimus levels in this patient without the presence of 3A4 induction caused by phenobarbital. We evaluated alternative causes for the undetectable level of everolimus. Altered drug metabolism and clearance were unlikely, because the patient had adequate renal and hepatic function. The patient brought into the hospital his at-home supply of everolimus and demonstrated knowledge of, and compliance with, his medications. His drug regimen was reviewed for alternative drug–drug interactions, but none was identified. Although we could consider the possibility of CYP3A4 polymorphism, this information is not readily available. Although routine monitoring of everolimus levels is not recommended in the treatment of patients with renal-cell carcinoma,9 monitoring may be considered when everolimus is used in conjunction with agents that may significantly alter the drug’s pharmacokinetics. A prudent approach may be to increase the drug’s dose in 5-mg increments, according to the manufacturer’s recommendations,2 and ensure that the trough level is at least detectable. To our best knowledge, this is the first case describing the probable drug interaction between everolimus and the potent CYP3A4 enzyme inducer, phenobarbital. Therapy with everolimus requires close supervision. Avoiding concomitant use of potent CYP3A4 inducers is prudent. When significant drug interactions with potent CYP3A4 inducers cannot be avoided, a dose increase in everolimus may be warranted, and sampling of trough levels may be considered. Dr Metayer and Dr Rozov have no conflicts of interest to report. Yap KY, Chui WK, Chan A. Drug interactions between chemotherapeutic regimens and antiepileptics. Clin Ther. 2008;30:1385-1407. Afinitor/Afinitor Disperz (everolimus/everolimus tablets for oral suspension) tablets [prescribing information]. East Hanover, NJ: Novartis Pharmaceuticals; April 2018. Grabowsky J. Drug interactions and the pharmacist: focus on everolimus. Ann Pharmacother. 2013;47:1055-1063. Lefeuvre S, Rebaudet S, Billaud EM, Wyplosz B. Management of rifamycins-everolimus drug-drug interactions in a liver-transplant patient with pulmonary tuberculosis. Transpl Int. 2012;25:e120-e123. Fijałkowska-Morawska JB, Jagodzińska M, Nowicki M. Pulmonary embolism and reactivation of tuberculosis during everolimus therapy in a kidney transplant recipient. Ann Transplant. 2011;16:107-110. Kovarik JM, Hartmann S, Figueiredo J, et al. Effect of rifampin on apparent clearance of everolimus. Ann Pharmacother. 2002;36:981-985. Horn JR, Hansten PD, Chan LN. Proposal for a new tool to evaluate drug interaction cases. Ann Pharmacother. 2007;41:674-680. Shipkova M, Hesselink DA, Holt DW, et al. Therapeutic drug monitoring of everolimus: a consensus report. Ther Drug Monit. 2016;38:143-169. Anandappa G, Hollingdale AE, Eisen TG. 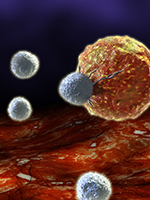 Everolimus—a new approach in the treatment of renal cell carcinoma. Cancer Manag Res. 2010;2:61-70.